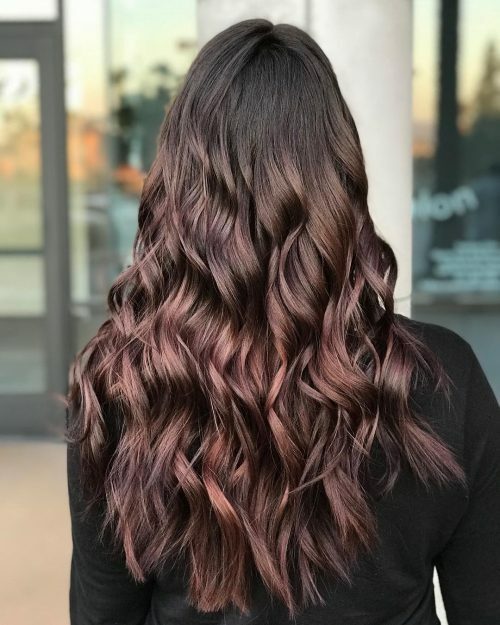 Dark red hair transcends the list of the most popular and stylish fashion colors this year because of its striking beauty. Bolder and edgier than the common red – this vampy version takes on a lot of forms. Chestnut, auburn, burgundy, and wine red are only a few of the fan-favorites! 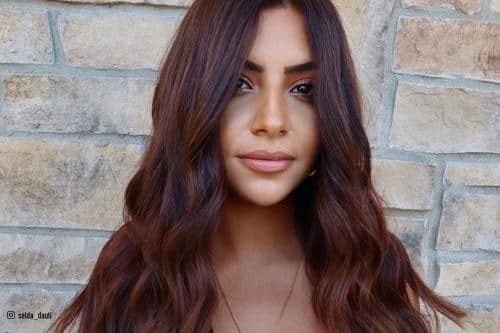 Another reason why women and colorists are falling for this deep tone is how it can charmingly soften facial features and give your hair a multi-dimensional finish without having it go through too much dyeing processes that can ultimately ruin your beloved mane. 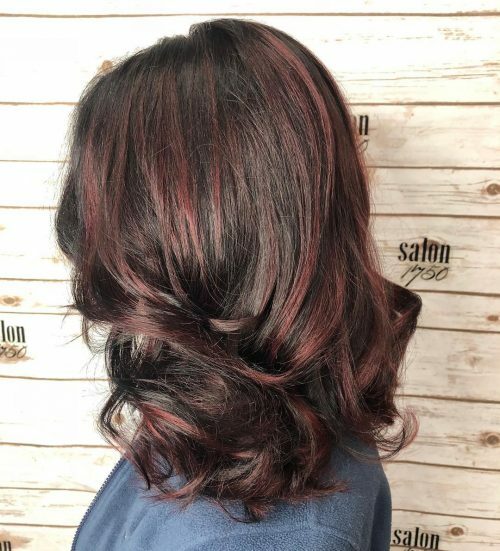 Dark red hair lets you have healthy locks while allowing you to dress your tresses in a super fashionable way, so you can turn heads around in a flash! Enjoy a mix of both coolness and warmth in this alluring contemporary hair color! Come now and see what styles of dark red hair can flatter you and your personality the best! Dark complexions always go well with luscious and vibrant reds for their strong and edgy traits especially when combined together. This high ponytail is made even more stunning by the solid ruby hue that flatters it. Natural redheads can change to this darker tone for alluring change. This one’s a super easy way to spice your hair up when you’re craving for something fun! Pair with a perfectly shaped haircut and for sure you’ll be turning heads around! 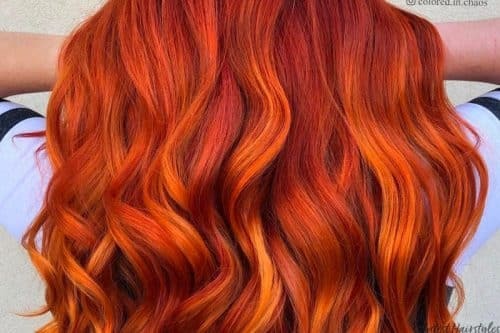 This super hot and bright fiery hair will surely make you stand out of the crowd! No matter your skin color, you can rock this one out as long as you’re committed to maintaining it! 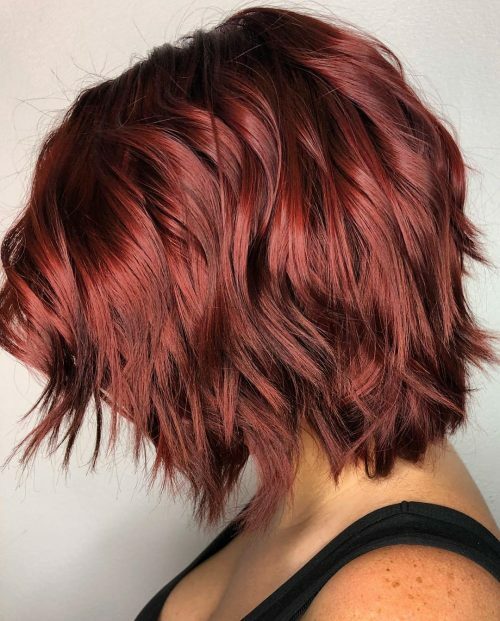 Make your bob a real eye-catcher with this vibrant and fabulous reddish brunette hair color! 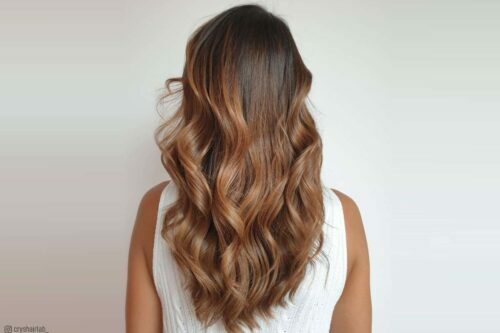 Don’t worry as this versatile shade works fabulous on any hair texture – straight, wavy, or curly. There’s nothing wrong with having retro chunky streaks of gold on your auburn mane. This funky style is great for those who want to get some brightness for their hair. 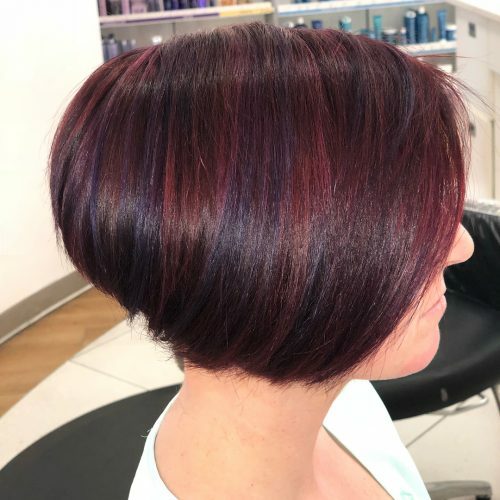 This dark cherry color will give you a sophisticated yet sweet vibe! Perfect for short to medium length hair for easier maintenance. Of course, you still can have the benefits of warm tones to go with a darker shade of auburn. 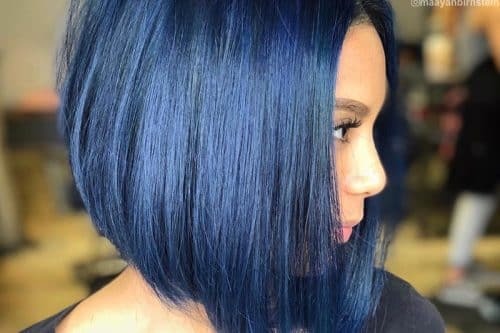 This vibrant and bold hairstyle is so smooth on straight hair. This look to me screams fire and passion. From top to bottom, it’s carefully and strategically pigmented to bring out the deepest most luscious red. I used Pulp Riot color melting a 5-66 with -66 booster melted into a level 8 balayage. Then on top of the balayage, I used their fireball to overlay and bring out the inner fire goddess she is. 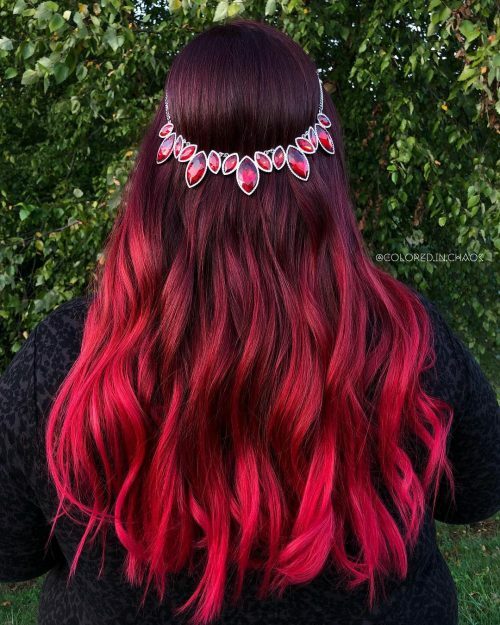 The ruby necklace is to be a little pop to the top of the hair. The loveliest thing about this look is how fierce it makes her, not only bringing out the natural pigment in her skin but also her personality. My one and only hope for each client is that they feel as fierce as I’ve made them look! I also love how versatile this type of color style is. You can curl it, braid it, top knot it, and pony it, and it still looks amazing! The only thing I would consider is the type of skin tone one has. But again, it is super versatile because it goes with a true red and a deeper red. It looks amazing on different skin types. Also, I would definitely consider the upkeep. Red is work and maintenance. A creative color is also work and maintenance. However, proper at-home care can have you looking amazing and vibrant for a long time. This particular client has gone since September to now (January) and still has almost the same vibrancy as the day she got it done. But that is only achievable with a proper at-home care which can be guided to you by your stylist. I call this color mix “vampire black cherry!” It’s a black color melted root, which glides into bright, seductive red. It’s a great fall look for those wanting to spice up their appearance! 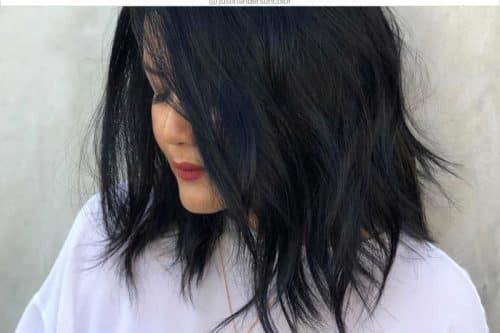 It looks great with dark eyes, and a warmer (or neutral) skin tone and a color melt is a great option if you’re anxious about wearing a vivid color for the first time. It’s actually perfect for brunettes who’ve never colored their hair and want to try something fun, with zero to minimal damage! As with any hair color, I recommend getting a good deep conditioner, such as K-Pak from Joico. To achieve sleek, baby soft hair, I use a blow dry gel and a shine spray and blow it all out to finish off the look. For blowout tutorials, I recommend Brad Mondo’s method. It’s my go-to for a sleek, bombshell blowout! I also smoothed down flyaways with hairspray and a baby toothbrush. For the haircut, this is a long layered cut with face-framing, good for balancing out any wider face shape. 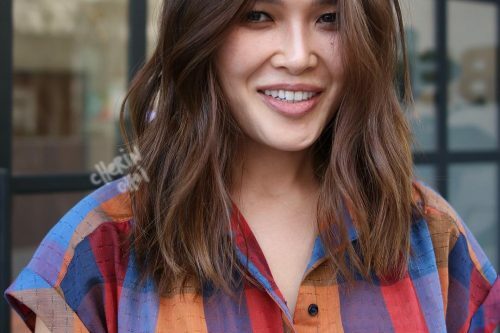 If you have an oblong face, I would avoid this haircut, but with a heart-shaped or round face, this works well to slim and elongate your features. If you have thick hair, ask to get it thinned, or for long layers. 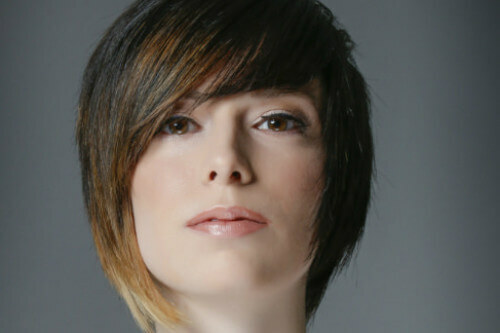 If your hair is fine, ask for a blunt cut with face-framing, sharp lines add thickness to the look. Happy Hairstyling! The loveliest thing about this look is how bold yet naturally beautiful it is. I enhanced her natural red color with coppers and golds and cut a textured medium length cut. Just go for it! Especially if you have green eyes. It’s bold, it’s beautiful, and it resembles natural beauty. Always use professional, color safe shampoo and conditioner to keep the color long lasting. For shine, I use Verb Ghost Oil. I am obsessed with it. 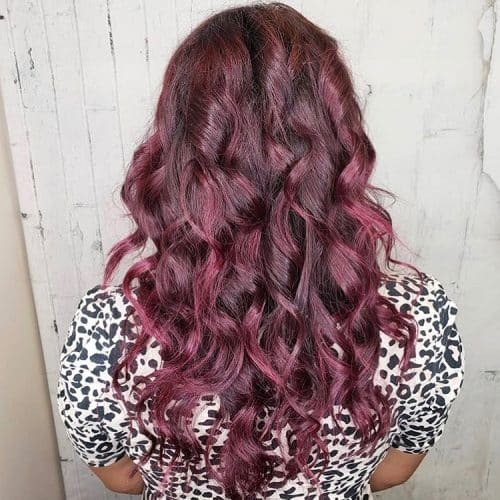 Me and this client agreed that this look is best described as berries and wine! When this client came to me, she started with her natural color and had only ever done highlights. For her first visit with me, we did a very soft lavender all over and then she asked me for something more vivid. 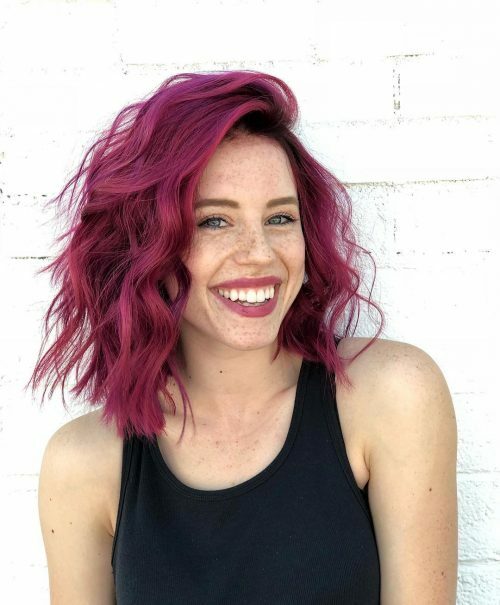 The cutest thing about this cut and color combo is that it matched her very fun loving and wild self. That is the wonderful thing about doing what we do, it can be used to accentuate a personality. 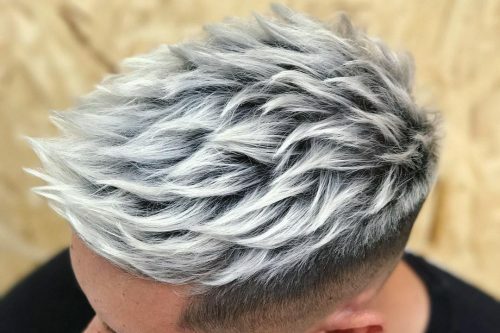 If anyone is considering a color like this (or anything in the rainbow family), I definitely tell them that it is not only a change of color but a change of lifestyle. If you are a person who likes to shampoo every day, this might not be the color for you. Using professional products at home is a must, as these colors won’t last very long with products that are not made to support them. Dry shampoo is your new best friend with maintaining a wearable style without shampooing too frequently. 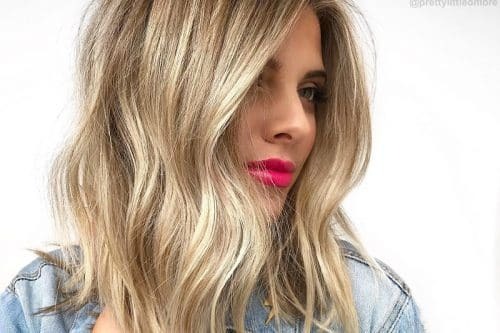 Also, when considering a color like this one, I am always upfront with my clients about the level of maintenance required and this is a very high maintenance color. I love formulating for red hair color, as they have a special spot in my heart. I think about what red object does my guest want their hair to look like. In this particular cut and color, I was thinking of the ruby in the movie Aladdin, you know, the one Abu can’t keep his hands off of. As far as the cut, I love cutting bobs, especially if they are undercut. It just creates a better shape depending on the density of the hair I’m working with. My main goal is to always have the guest’s hair looking expensive, not just when they leave the salon, but when they take care of it on their own until their next visit. How much maintenance are you looking to keep up? Reds are just as maintenance as a blonde, if not more. Reds fade the fastest, so we needed to decide on if she wanted to be a cool or a warm red. 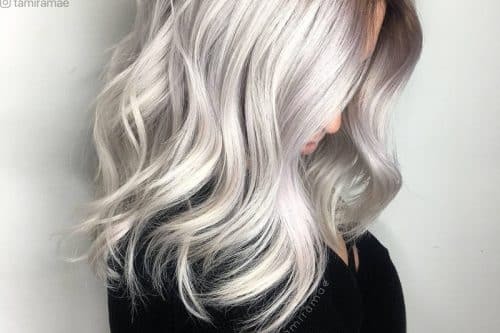 Let her know that her ends need to be refreshed every 4-6 weeks and low heat settings when it comes to hot tools because they cause the color to fade quicker. The product that I recommend for at-home care is essential to keeping the color looking expensive. I work for Keema salon in burr ridge Illinois, and we are an Aveda lifestyle salon. 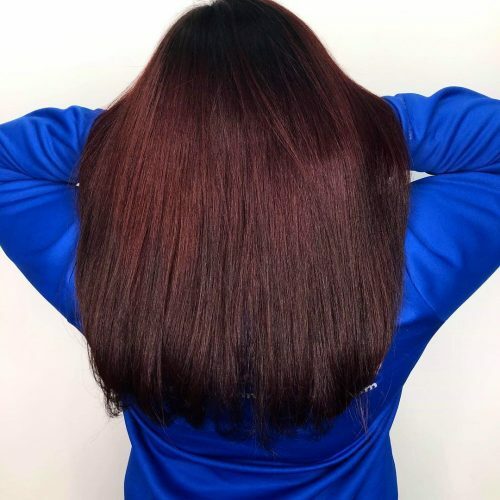 The products that I have this particular guest using is our Be Curly co-wash shampoo (it has babassu oil in it, so that helps keep the hair hydrated and prevents the color from fading), and I have her on our color conserve conditioner. Styling products she’s using are our Speed of Light blow dry accelerating spray (cuts blow-dry time in half, detangles and is a thermal protectant), Color Conserve daily color protect leave-in conditioner (helps keep color from fading by 28%), and last but not least, because she has softer finer hair, we use our texture tonic spray (it gives a good grit to the hair from the Epsom salt and cane sugar). Lastly, she uses our air control light hold, yet buildable hold, hairspray. When it comes to wearing red vibrant red hair, the personality comes out that you never knew you had inside of you. It’s kind of cool how haircut and color work like that. The hair type to me doesn’t really matter on if you can be a redhead or not because if you understand the fundamentals of color theory, you can formulate for any color on any hair type. We definitely need to take into the effect of skin tone and makeup. If the guest has a pale skin with pinkish tones, you’re going to want to formulate for more of a cooler red. If the guest has more of an olive skin tone, you’re going to want to formulate a warmer red. We have to think of the color wheel and the complementary colors. The face shape plays a role as well for color blocking and highlight placement to give the guest the ideal face shape, oval. The same thing with the cut, we need to pick a length with bobs that accentuate their beauty. I also like to always think of what would be easiest for them to style, how much time do they have when getting ready, how often do they want to wash their hair, what kind of texture will work best for their hair type, what extra styling products are they wanting to use? So many open-ended questions go into play in a successful consultation with your guests. I have gotten very lucky to have this client in my chair. She is extremely adventurous and always lets me have fun and give her suggestions with colors and cuts that I feel would fit her nicely. With this look, the best thing about this style would have to be the vibrancy. You don’t see a lot of people with this shade of purple. It’s extremely unique and completely formulated to my client’s liking. Another thing I love about this style is seeing all the different shades of purple throughout the curls. Consider the maintenance of the vibrancy. I always suggest purchasing a color depositing shampoo to use between services. 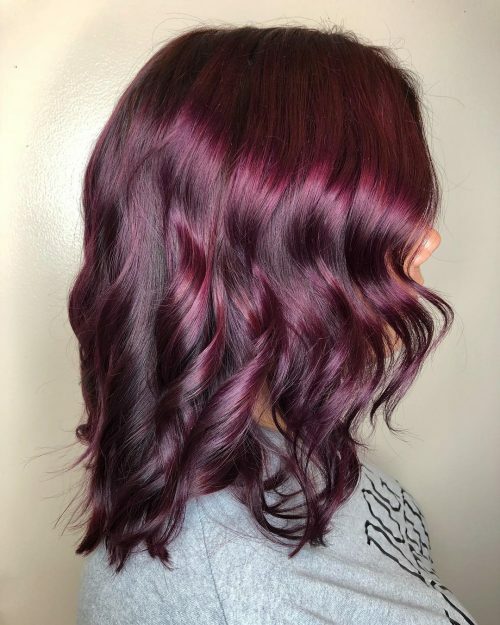 I also like to suggest my clients coming in at least 2 weeks after their first appointment so we can build up the color to help keep the vibrancy longer. This shade, I personally feel fits people with cooler skin tones rather than warmer skin tones. It’s a cooler shade so it tends to sit better against cooler tones. It’s a plum color ombre, and I love how vibrant the color came out. This is for anyone who is looking for something new and fun. It’s something that isn’t too crazy but will get people to notice your hair. This is one of my favorite colors that surely anyone can pull off. The first thing that comes to my mind is vibrancy. The things I love about this color are that it looks different in the light and it’s a color that is shiny and rich. It needs a high maintenance, and it will need to be taken care of using the right shampoo and right product to conserve the color. I have also given her a new haircut full of movement, easy to style, and can be carried different ways from conservative to casual. This long bob style gave her more confidence. 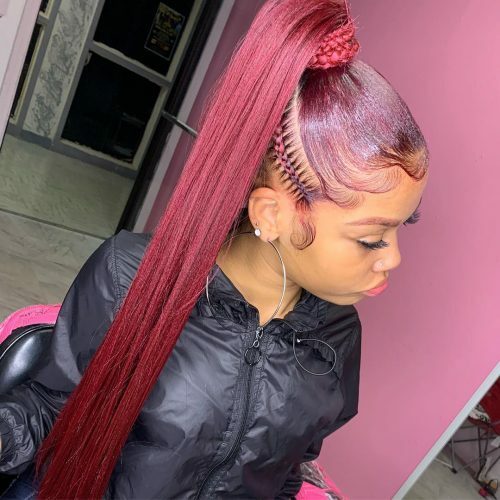 This is a style and color the can be used pretty much in any type of hair, is not that long or short, and is more amazing with the way it transitions with the skin tone. The best thing about this look was the contrast and shine. So many times with multidimensional colors you loose the vibrancy and get a more blended look. I was really pleased with the depth of the dark brown versus the red. 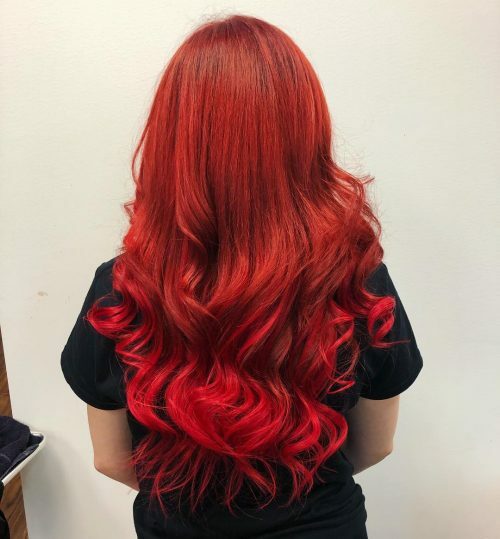 The red really popped and gave visible definition to this style very consistently from roots to ends, plus it was so shiny. This style will be a very low maintenance look overall for my client. 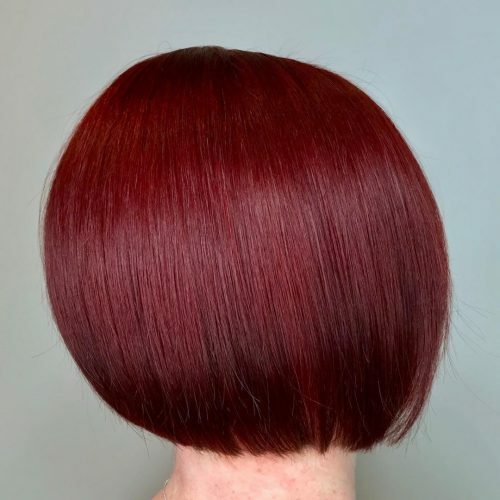 The red will lose its vibrancy over time as it fades but with matching her natural base everything will blend out nicely allowing her to go long lengths between sessions. This length is a great length to style. It’s sassy but still long enough to upstyle for a quick fix. My client will be able to use her natural wave for quick styling days also or use a quick pass with a large iron to give these fun bouncy curls after blow drying for a more polished look. Her options are endless with this length and very becoming for rounder face shapes as hair passed the chin helps elongate and slender your face. So flattering! 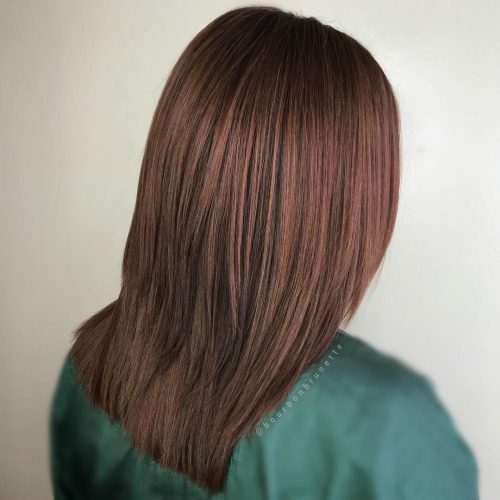 This dark mahogany with a balanced warm red was created by layering subtle, slightly warmer highlights over a cooler base. I love how it reminds me of some of my favorite spices: cinnamon, clove, and saffron! 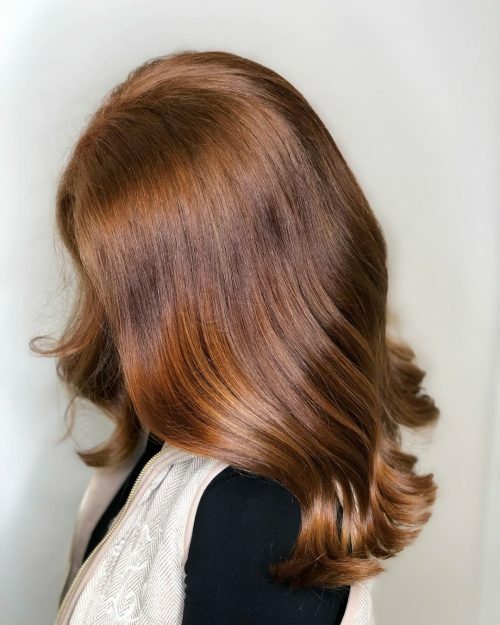 If you’ve been a long time brunette, deep reds and auburns are a beautiful way to enrich and add complexity to your hue! 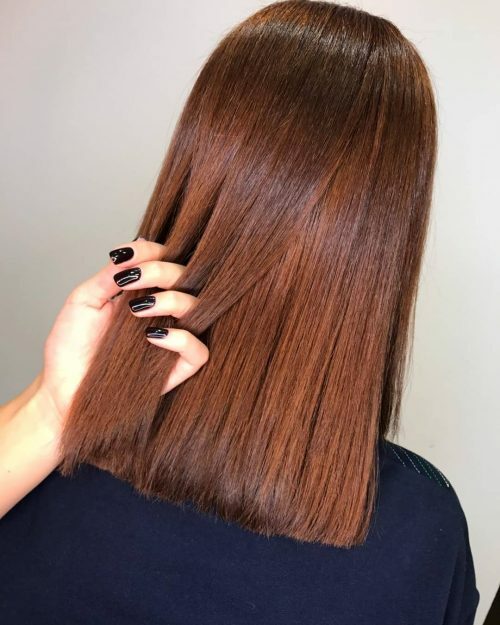 A soft cast of copper or burgundy can easily be maintained with regular salon glossing treatments (which also add incredible shine) or at home with color depositing shampoos and conditioners like Celeb Luxury. This look gave me an inspiration of fall. 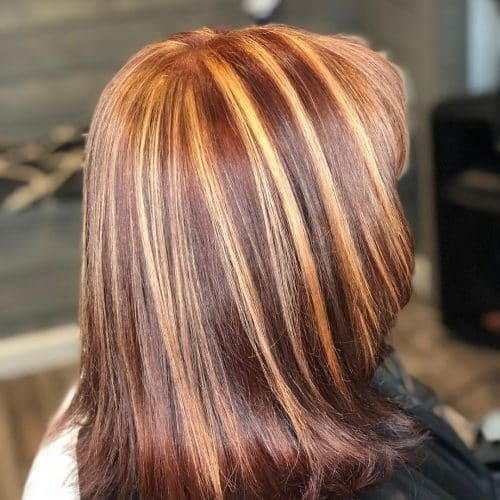 I called it “cinnamon spice,” nothing says fall hair like this transformation. With her, I did a mixture of mahogany and chocolate both by Rusk but darkened her roots with a dark ash brown melting it into the color. I went with this color to fit her skin tone better. She had old blonde ombré that actually washed her out and not to mention was all wrong for the season. After completing this look she loved it and loved it even more than her hair color before. First, is her skin tone right for this color? 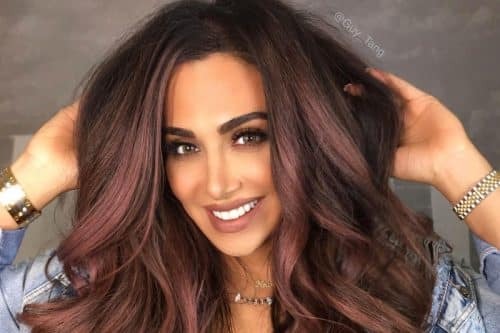 Is her hair the right shade to pull this color off? Just right or do I need to lighten it a little more? Luckily my client didn’t need to be lighter, however, her hair was too light so I had to fill the ends first then apply the color. 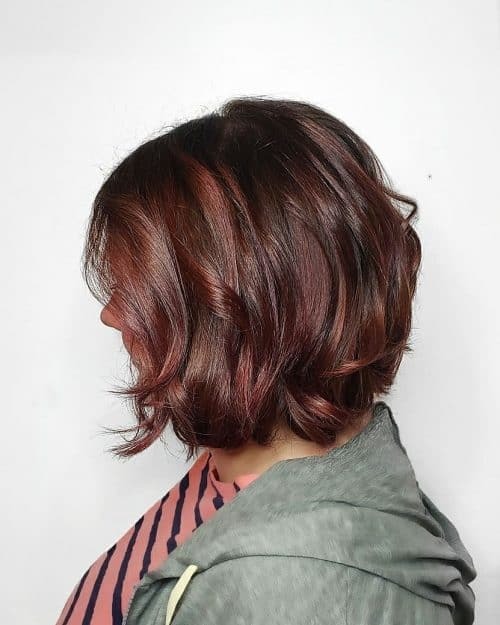 This is a rich burgundy hair color paired with a trendy angled bob. 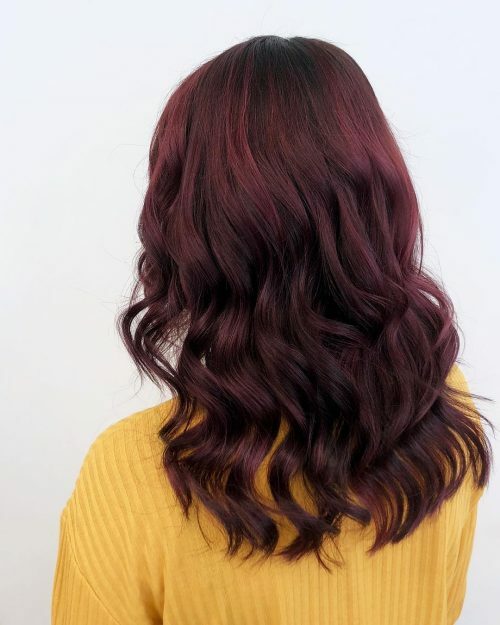 Burgundy is a mysterious shade for women wanting dark red hair color. I love her haircut because this is 9 months of progress and effort of repairing her hair from previous chemical damage. 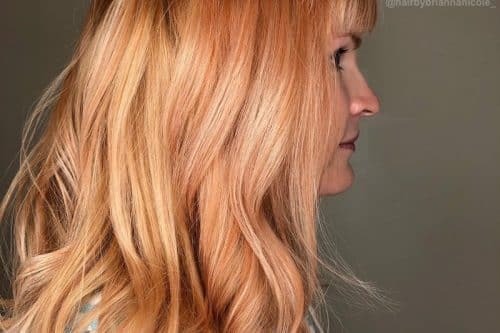 We’ve slowly but surely transitioned from a dark brown/damaged brassy blonde to a healthy beautiful cool toned blonde, to this now gorgeous color. 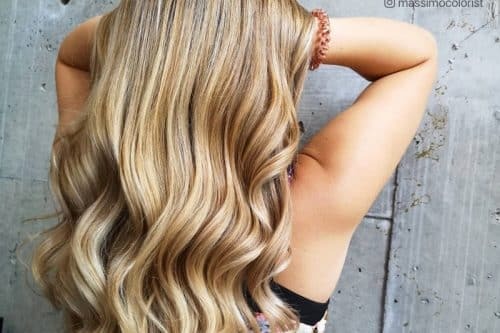 I love everything about this color and style, from how much movement and texture she has whether she styles it straight or with beach waves to the deep but vibrant tone which is especially perfect for fall. I also love her haircut because it is very stylish and trendy. 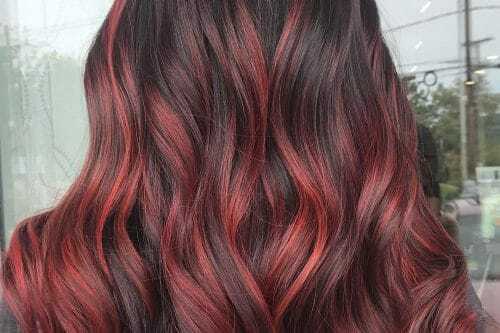 In my opinion, I think anyone can rock this dark red hair color. It’s all about confidence (and your love for reds/warm tones and dedication to maintenance). 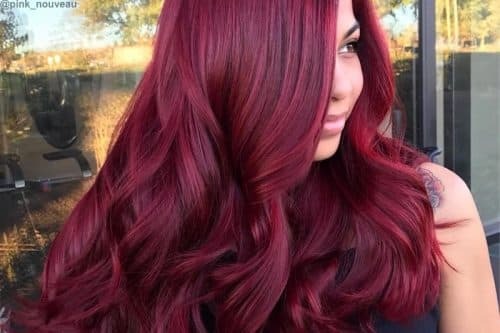 This color is a lot of maintenance because reds are stubborn and like to fade fast, so I recommend washing your hair no more than 3 times a week, using cold water and sulfate free shampoo and conditioner as well as a dry shampoo for those in between wash days and a heat protectant before you blowdry, and use any heating tools. This will help to seal your hair cuticle and the color within it. (My favorite products are Redken color extend magnetics shampoo conditioner, Redken pillow proof primer two-day extender, and Redken pillow proof primer). This will help to preserve your color until your next appointment without facing too much fadeage. My client comes in every 4 weeks for a root touch up and a glaze to refresh her ends. The maintenance of her haircut is also every 4 weeks. Even though we are growing her hair out we still refresh her shape and remove any dead ends. 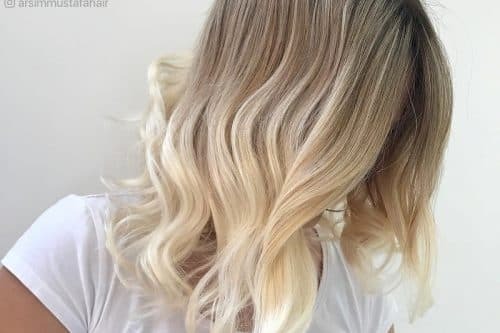 This haircut is perfect for fine, medium or thick hair, as well as straight, wavy and curly hair and is easily customizable for how much texture and movement you are/aren’t wanting. If you tend to put your hair in a ponytail a lot or don’t like short hair then this haircut wouldn’t be for you, but there are many ways you can still style your hair and keep it out of your face (top knot, braids, headbands).